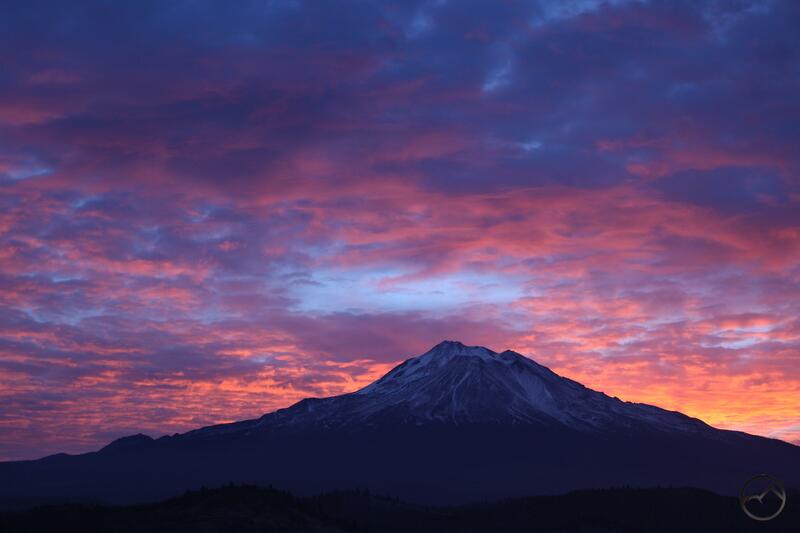 Sunrise on Mount Shasta at the dawn of 2014. Mount Shasta, the great beacon of the southern Cascade Range, has been unusually bare thus far this winter. It is odd to have crossed over into a new year and still see the mountain looking as if it were mid-autumn, when all the previous winter’s snow has been burned off by the summer sun and the naked rock yearning for winter to return and smother it the snow’s embrace once again. 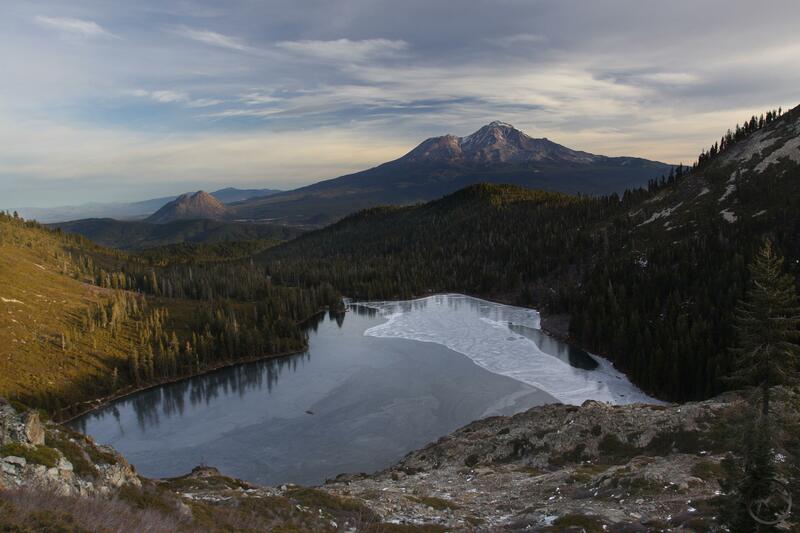 Yet, as we near the mid-point of January, Mount Shasta still waits for winter’s touch. To be sure, a couple of storms have rolled through and sprinkled the mountain white a few times. In fact, Mount Shasta got its first healthy dose of snow back in September. Every month since has seen the mountain covered in a thin mantle of powdery ice only to see it blasted clean by the howling winter wind. Of course, if Mount Shasta has not been graced by winter’s snow, then it goes without saying that the surrounding mountains have little to show for the cold season. The great forests, deep lakes and towering cliffs of the Trinity Divide all show evidence of the biting cold but lack the snowy cloak that usually comes with winter. This condition should naturally give us pause as we consider the ramifications for the coming year and our use of water resources. A lack of snow and rain now means scarcity further down the road. To be specific, Northern California is currently below 20% of the average snow pack for this time of the year. That translates to a thin patina of snow in some places and bare ground everywhere else. According to the Department of Water Resources, if the current snow pack were to persist throughout the rest of winter, farmers would only receive 5% of their requested water allotment. Already stories have percolated north of fields lying fallow and groves of trees, rendered unsustainable by the prospect of drought, being ripped up. It is strange, living in one place and gazing at a naked volcano and thinking that the lack of snow on the mountain impacts farmers hundreds of miles away and consumers of their crops even further still. Mount Shasta sports plenty of clouds but the snow is still lacking. 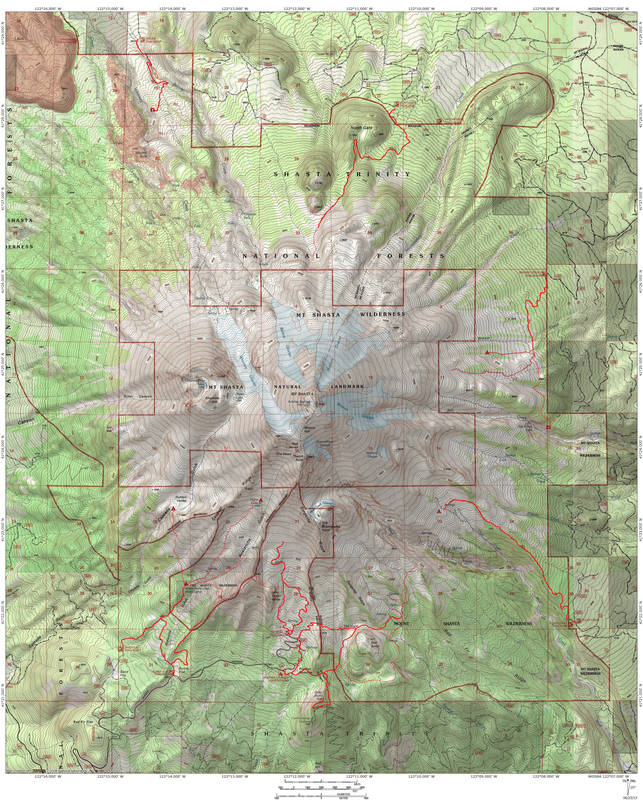 Needless to say, this was not how I anticipated starting Hike Mt Shasta’s blog for 2014. Among the themes I had planned on developing over the winter was a continuation of my series on off season trails and some thoughts on the distinctives of aridity. For the time being at least, the former is not necessary and the latter might seem a bit extraneous. So, while I am confident that winter will arrive and water conditions will improve considerably, those of us who enjoy hitting the trail might as well reap the benefits of the heretofore dry winter. Typically mid-January is a time when the high country is generally unreachable. The roads to the trailheads are unplowed and many, many more miles would be added to the journey. Of course, snowshoeing and cross country skiing are options and quite enjoyable. Still, they do not usually permit one to reach the finer destinations high up in the Trinity Divide. Now things are different. If one does not mind colder temperatures (and even that is not as bad as it often is this time of year, with highs in the upper 50’s), then nearly every trail in the area can be accessed. Right now presents the rare opportunity to hike into lakes that one normally only sees in the summer and fall months. Their frozen surface lacks the clear reflection one expects from a still summer morning but it is still a stunning sight to see the glistening ice covering their frigid waters. As noted previously, most of the roads are still open. Nearly everything in the Trinity Divide can be accessed, either off of South Fork Road, Parks Creek Pass, or the road in the Castle Creek drainage that climbs up to Horsethief Meadows. The most notable road closure is the Everitt Memorial Highway beyond Bunny Flat. The county closes that section of the road at the beginning of November regardless of the snow conditions. This means that the trails originating from the Old Ski Bowl and Panther Meadows trailheads are inaccessible. Still, for those who want to explore Mount Shasta, the trails departing from Bunny Flat trails departing from Bunny Flat are prime destinations. The other trailheads on Mount Shasta are accessed via remote dirt roads and their conditions are uncertain. Be careful while exploring these areas this time of year. Icy conditions can persist in shady areas and this can be a serious challenge while descending steep downhill sections (I learned this the other day when my jeep slid down an ice encrusted road north of Mount Shasta). Despite these unknown quantities and the colder temperatures, I hope everyone is able to get out and enjoy the trails around Mount Shasta a little more before winter’s fury finally falls upon us! UPDATE: I published this post shortly after midnight in the early morning of January 11th. At 6:30 I left to try to take some more dawn images of Mount Shasta. There were stars visible when I left. By 7:00 it was raining hard. The storm is only supposed to last for a day but it is a start. Let’s hope more comes soon! I’d love to be able to send some of our snow your way! What a gorgeous photo of Mount Shasta. I hope you get some much-needed snow soon! Glad to hear that it’s raining today! I have not been up on that side of the mountain for a while so take this with a grain of salt. I reckon the road is clear all the way to the trailhead. The biggest challenge you would encounter is pockets of ice in shady areas. If you have 4×4 you should be fine. Again, I have not been over there but that is basically the conditions I have encountered at similar elevations to the north of Mount Shasta. I hope that helps!